Of course, finding a good stretch of road for that speed wasn’t so easy. Sandy trails were just about the only “roads” in Volusia, and they were passable only by wagons drawn by a team. No one would make the mistake of driving the new fangled horseless carriages with narrow rubber tires through the loose sands of Volusia (except on the hard-packed beach). Today it takes only five minutes to get from South Daytona to downtown Daytona Beach, but before automobiles and paved roads it took all day to take a wagon and team from Blake [now South Daytona] to Daytona and back to buy supplies. There was no road back then directly from Blake to Daytona. You had to head west to the Old King’s Road (highway) that had been built in the 1760’s and then head north to connect with the sandy trail that went from DeLand to Daytona (Hebel 14). If you’ve ever tried to drive off-road in the wooded areas of Volusia, you know how quickly your tires can slit a groove into the sand and bring your car to a dead stop. I remember when I was a teenager in the 1960’s, pulling onto a sand road off Beach Street a few miles north of the Granada Bridge. The sand seemed firm, so I zipped my convertible sports car in a care-free manner down that narrow strip of sandy road until it suddenly turned to the left and became, instead, a sandbox; so I deftly down-shifted and then scooted the accelerator a bit when without warning I was faced with the end of this sandy road and had to brake suddenly to stop, but that let my tires slice into the “sandbox” and in less than two seconds the tires were so deep that after an hour of work to get out, I had to walk to the paved road and thumb a ride to a phone to call a tow truck. That was how all the out-of-town roads were until years after 1900. Ten years earlier, in the 1890’s, DeLand residents were “paving” their city streets with pine needles, probably to reduce the dust, but also to make it easier to drive over the sand (Hebel 14). Daytona’s progress was marked by the use of marl or shell to keep their residential streets usable, and sidewalks were also spread with marl, which caused shrubbery along the streets to be covered with white dust during dry weather (Hebel 14). 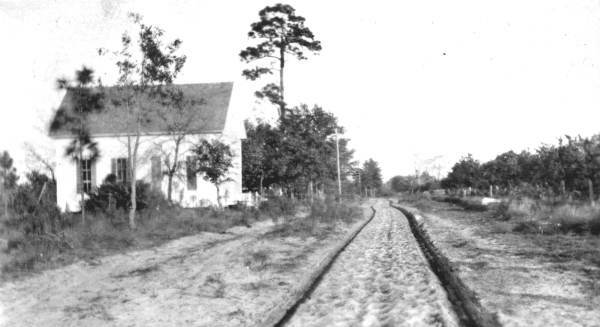 In the open land between towns, there were no paved roads at all in Volusia until 1901 when the road connecting DeLand (the county seat) and Orange City was marled. That was a sign of progress (Hebel 14). That same year, a road was made to connect Daytona and Port Orange, so it was no longer necessary to go only by boat; and the next year, 1902, the narrow sand road [only 7 1/2 feet wide] that hugged the Halifax River between Ormond and Daytona was also marled (Hebel 14; Fitzgerald 192). Passable roads for wagons were always concerns, but they weren’t really worth the cost in taxes to most residents, so although towns maintained their residential and commercial streets, it wasn’t until 1901 that paving became necessary because that was the year when the first horseless carriages were brought into Daytona, the most populated city in Volusia with its 1,690 people (Fitzgerald 191-192). Threaded through the drier sections of the wilds between Daytona and New Smyrna was a sandy road that today we would call a trail, and it was almost impassable, so a boat was the common means of travel, whether for personal transportation or the transport of goods. A trip from Daytona to the county seat in DeLand was even worse because you had to go by land, and round-trip usually took twelve hours by team (Fitzgerald 192). This wasn’t unique to Volusia, though. In 1901 there were only about 125 to 150 miles of paved roads in the entire United States, so Volusia was not behind the times at all (Hoppin’ Rattlesnakes). By 1902, wealthy men were beginning to stage races on the hard sands of the beach in the tiny winter resort town of Ormond (which had a year-round population of only 595), but crowds loved the roar and speed of these horseless vehicles, and to accommodate the cars and mechanics, the historic Ormond Garage was built along the road recently cut from the Halifax River to the ocean (Fitgerald 191, 193). This was still the time of horseless buggies, strange contraptions like the one owned by Port Orange resident, retired Army Colonel F. W. Roe, who drove his three-wheeled automobile into Daytona in early 1903. Everything was up-to-date in Daytona (Fitzgerald 193). That year, 1903, Daytona got its own automobile garage, operated by J. C. Pettepher on Orange Avenue, and it wouldn’t be long before he would begin road tours, no doubt for those looking for more adventurous travels than the river tours they could take on the Halifax and Tomoka (Fitzgerald 193). On the rutted roads between towns, the driving was challenging, but by August 1904, R. L. Ivey and S. V. Hough set a new speed record by driving their Oldsmobile all the way from DeLand to Daytona in only two hours and twenty minutes, and in the seats with them were F. N. Conrad and Volusia Sheriff J. R. Turner (Fitzgerald 192). The Oldsmobile was the first automobile produced by assembly-line, and this 650-pound wooden-framed open buggy with its 5-horse-power single-cylinder gasoline engine quickly surpassed the Locomobile Steamer car as America’s favorite automobile, including the expensive Ford known then as “Doctor’s Car” (“Oldsmobile Curved Dash”; “1903 Oldsmobile”). With the growing importance of road travel, Volusia residents began to “chip in” in 1903 to build a road between Daytona and New Smyrna after Volusia County commissioners approved $6,000 if public “subscriptions” could fund the remainder needed (Hebel 14). With the road still in progress in December 1904, J. C. Pettepher became the first to drive this “uncompleted road” connecting Daytona and New Smyrna, but the entire shell road wouldn’t be finished until March 1905 (Fitzgerald 193). Earlier in 1904, in February, a proposal was made for a highway to stretch from Jacksonville to Daytona, and logically, the plan was to use the beach as part of the “road” (Hebel 14). Locally, in 1904, the two towns on the “peninsula”–Ormond and Seabreeze–had only trees and undergrowth between them, but in July an “unimproved road was opened,” connecting Ormond with the new beachside community that would not reach a population of 639 for another six years (Hebel 14; Fitzgerald 191-192). In January 1905, the race was on again to see how fast someone could drive across county, and race driver Barney Oldfield cut that record in half, zooming from Daytona to DeLand in only an hour and twenty minutes, and to witness this historical event “half the population of Daytona” turned out just to see the car leaving town, and about half of the people of DeLand came out to be there when Oldfield arrived (Fitzgerald 192-193). Up north, roads were being improved to reach Daytona, and in January 1907, Ralph Owen became the first driver to make it from New York to Daytona, taking him only two weeks and three days to get here (Fitzgerald 193). During that winter, February 1907, a new road was being cut on the peninsula along the river down to Mosquito Inlet [now Ponce Inlet], and by October, the road between DeLand and Daytona was to be improved with shell, but this work would cost county taxpayers a levy of an additional four mills. New roads were never cheap (Hebel 14). During the following winter, in January 1908, the first drive from Jacksonville to Miami was completed, and James Laughlin III, along with a New York photographer, made it in only six days through the “sand and water” because the two of them together were able to cut 30 stumps from the roadway to speed up their drive (Fitzgerald 193). That same month, January 1908, Daytona “snowbird” Thomas H. White funded improvements to the highway between St. Augustine and Daytona. His wealth and fame had come as founder of the White Company which later expanded into White Sewing Machines, White Motor Company, White Trucks, and others. His company’s 1907 White Steamer was used by the Secret Service to follow behind President Theodore Roosevelt’s horse-drawn carriage, soon after the steamer became one of the first cars in the White House (Hebel 14; “White Motor”). The Old King’s Road (which had had repairs but few improvements since it was built in the 1700’s) was still in use as the highway from St. Augustine, but Thomas White’s funding ensured that the road would be passable by paying for trimming the growth along the narrow road, for clearing the road itself, and by bridging waterways along the route. Volusia historian Ianthe Bond Hebel notes, though, “All motorists were advised to carry a small ax and a shovel to fill holes and cut away fallen timber” (Hebel 14). By 1910, the Daytona Daily News was advertising cars for hire, not for driving but for being taken on land tours in Volusia. With Daytona’s population having doubled in the previous ten years to 3,572, there was a market for people looking to spend their money and their time out on the road. One chatty news item in the Daily News in February 1910 noted that a group of guests at The Despland Hotel in Daytona had chartered “Hubbard’s two big touring cars” for a picnic party to New Smyrna (“News of Hotels”). 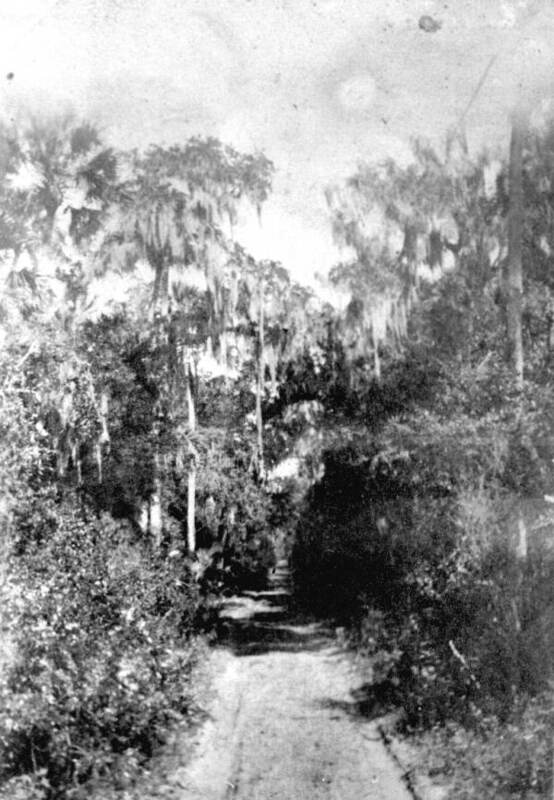 A few years later, during World War I, a road was finally cut south of Daytona on the peninsula to extend through the thickets and trees from Daytona Beach all the way to the Port Orange Bridge, and the road was known then as Maley Road, so-called for Volusia County Commissioner Jerome D. Maley (Hebel 14-15). Also, during the war, in June 1917, brick streets were completed within DeLand, as well as a “fine brick” road from DeLand to Lake Helen. Bricks were also laid toward Daytona, but the road improvements being made heading from Daytona toward DeLand were not brick. I can only guess that marl was used. It makes me wonder if brick was used in DeLand because it was the county seat (Hebel 15). Around 1917, as roads between towns were being improved into highways and as the state began to assume building costs, Florida began assigning numbers to the state highway system, though the State Road numbers may not have been posted until 1923 [and that original numbering system was changed again in 1946] (U. S. Highways). In December 1918, to honor the World War I hero, General John “Black Jack” Pershing, Volusia officially gave the name Pershing Highway to the road from Daytona to DeLand to Orange City, and the name Pershing Triangle was used for the roads that connected Daytona, New Smyrna, and DeLand (Hebel 15). Although ten years earlier Thomas White had paid for improvements to the highway from St. Augustine to Daytona, the drive from Jacksonville to Daytona after World War I still took five hours. The highway remained a narrow brick road north of Volusia, and according to historian Hebel, tourists motoring south “were being routed down the central part of Florida” (Hebel 15). It was not until 1920 that a “hard-surface” road was laid between Daytona and New Smyrna, once their populations had boomed to 6,270 and 2,007 (Fitzgerald 191, 193). In 1922, no road ran along the ocean north of Ormond, so Dana F. Fuquay, a land developer in Daytona, made plans for a new ocean shore boulevard to extend north along the beach from Ormond to his new project, Flagler Beach, and farther north to Matanzas Inlet. Then funding was approved the following year when Florida’s legislature issued $450,000 in bonds for the highway which became A-1-A, but it was not finished until 1927 (Hebel 16). By the 1920’s, truck traffic through Daytona had become so great that a survey was done in 1924 for plans to build the truck route that would skirt heavy vehicles to the west side of the canal that ran north and south through Holly Hill and Daytona. This truck route [Route 5A] was named Canal Road, and later it was extended to Reed Canal Road [south of Daytona] and eventually all the way to Rose Bay [south of Port Orange] where it joined US 1. During the 1960’s space program, Canal Road was renamed Nova Road to recognize it as the main artery taking daily-commuting workers from Daytona to Cape Canaveral [renamed Cape Kennedy after the President’s assassination] [I believe that the highway which later became US 1 had previously been Florida Route 5, and that is why Canal/Nova Rd. was designated as Route 5A] (Hebel 16). In 1925, US 1 was still in the planning stage, but it was to follow the Old King’s Road and Dixie Highway; and by 1927 its route included Jacksonville, St. Augustine, and Daytona on down to Miami. Also, in 1925, plans were being made for US 92 to run from Daytona through DeLand and on through Orlando to Tampa. [For details of the history of the routes of US 1, US 17, US 92 from 1926 to today, click here] (Historic Roads). During the 1930’s, the state speed limit was 45 m.p.h., but the Federal Writers’ Project (WPA) book about Florida said “Motorists habitually drive faster than 45 m.p.h. on the open road” (Federal xix). At that time Florida’s State Road Department was beginning improvements to the highway from Daytona to DeLand [today’s Route 92], but World War II brought this to a standstill, and as Volusia historian Ianthe Bond Hebel notes, “For a long time travelers between Daytona and DeLand went the long way via New Smyrna” (Hebel 15). For more than half a century before World War II, the road from Daytona to DeLand had headed out from Daytona using Bellevue Avenue on the south side of the single-runway airport, Sholtz Field; but as the war began, the U. S. Navy purchased most of the Taylor Dairy in that area to expand Sholtz Field to become Daytona Air Base; and then Bellevue Avenue was made to end at the airport. Instead, the entry/exit of Daytona was moved to Volusia Avenue [today’s International Speedway Boulevard], but the road work was delayed until several years after the war (Hebel 15). Volusia’s roads between towns by then were no longer the sandy, rutted roads of 1900 that had forced most people to rely on the Halifax, Tomoka, and St. Johns Rivers. Commercial traffic and new stores were quickly relocating along state highways, and within another twenty years automobiles made it so that stores no longer needed to be near residential area;, and modern grocery stores with acres of free parking, along with strip malls, the Daytona Mall, and the Volusia Mall changed Volusia’s towns forever. “1903 Oldsmobile Model R Curved Dash Runabout.” January 3, 2012. http://www.boldride.com/ride/1903/oldsmobile-model-r-curved-dash-runabout#gallery/17 (accessed May 3, 2014). Fitzgerald, T. E. Volusia County, Past and Present. Daytona Beach, Florida. The Observer Press, 1937, p. 192. Federal Writers’ Project of the Work Projects Administration for the State of Florida. Florida: A Guide to the Southernmost State. State of Florida Department of Public Instruction: Federal Works Agency Works Projects Administration, 1939. Rprt. 1956. On Google Books. http://books.google.com/books?id=DEjI9IVepygC&pg=PA16&lpg=PA16&dq=florida+marl+road+material&source=bl&ots=DGe0PBb_bZ&sig=8jIgVFYnkKqewqVzGGt5OHzX_Ao&hl=en&sa=X&ei=evVjU4SbF8G18AGKj4GADA&ved=0CCUQ6AEwADgK#v=onepage&q=florida%20marl%20road%20material&f=false (accessed May 2, 2014). Hebel, Ianthe Bond. “The Early Roads of Volusia.” In Centennial History of Volusia County Florida, 1854-1954. Ed. Ianthe Bond Hebel. Daytona Beach, Florida: College Book Publishing, 1955. “Historic Roads and Highways of Florida.” January 21, 2010. http://www.us-highways.com/flus.htm (accessed April 29, 2014). Hoppin’ Rattlesnakes: Oral Histories of Beach Racing in Volusia County, 1903-1958. Producers: Eric Breitenbach, Len Lempel, Fayn LeVeille, Buz McKim, and Preston Root. 2014. (2013, Rough-cut Version). “Oldsmobile Curved Dash.” October 24, 2013. http://en.wikipedia.org/wiki/Oldsmobile_Curved_Dash (accessed May 3, 2014). “White Motor Company.” April 27, 2014. http://en.wikipedia.org/wiki/White_Motor_Company (accessed May 2, 2014). Mr Bowden: I enjoy your pieces immensely, being now 86 years old and having grown up in New Smyrna where my grandmother was a Sams. The Sams family was a mover/shaker for quite some time. One of my memories is hearing that the road from New Smyrna to Deland was built by my grandmother’s (Cora Sams Wilson) brother Pat Sams, a state attorney who lived in Deland. I was told that he was paid by the mile which accounted for some right angle turns on what could have been a straight road (and some deadly accidents). Do you know that the Sams family kept a family archive, still large and intact? It certainly dates back to the 18th century and contains letters, diaries, photographs, etc. some now in the New Smyrna History Museum. It is intact and if you wish I would be happy to refer you to the present curator. But likely you know all that. Keep writing! Best wishes, Edward Wilson . If you have a chance, check out the travel story in my book The Sands of Time. A family came here from Jacksonville to see the first race and left an indelible story of slogging through palmettos and sand to arrive safely. Once when my daughter and I went south toward the Everglades, my wife decided to go to Hastings to the Potato Festival, I think it was called. She was told to go to Bunnell and get on the “Old Brick Road” that Henry Flagler had constructed so as to insure a steady supply of fresh vegetables to St. Augustine to his hotel there. She started and soon realized that it would have been nearly impossible for her large Oldsmobile 98 to be able to turn around, so to avoid getting stuck off the bricks, she continued. At that time, not one automobile or truck ever came in sight. She finally got to Hastings and was much relieved to finally have gotten there. The bricks that were used in Henry Flagler’s road were manufactured in Birmingham, Alabama and shipped to St. Augustine. This is my conjecture as I have not consulted any sources, but the bricks are marked as Birmingham Alabama. In watching birds, I have driven Henry Flagler’s Brick Road many times. One brick road that is closer to Daytona is located in Tiger Bay State Forest off 92. Love the history of our town….New Smyrna Beach!